New Americans 360 is a documentary series exploring the multifaceted stories of refugee communities who have recently arrived in the United States. The project in its initial stage consists of three 360 documentaries exploring the lives and experiences of New Americans in the Rust Belt. The overarching objective of the series is to generate a deeper understanding of the global refugee crisis and its immediate effects on American cities. The project will approach the refugee experience at a micro level, focusing on smaller communities as opposed to refugees as a monolithic entity. Through this more focused and character driven approach, the films will convey the uniqueness of each story and reveal the complicated and pluralistic nature of the underlying theme. This project is currently in development and has been a generated as part of the Oculus Launch Pad program. 360 video still. 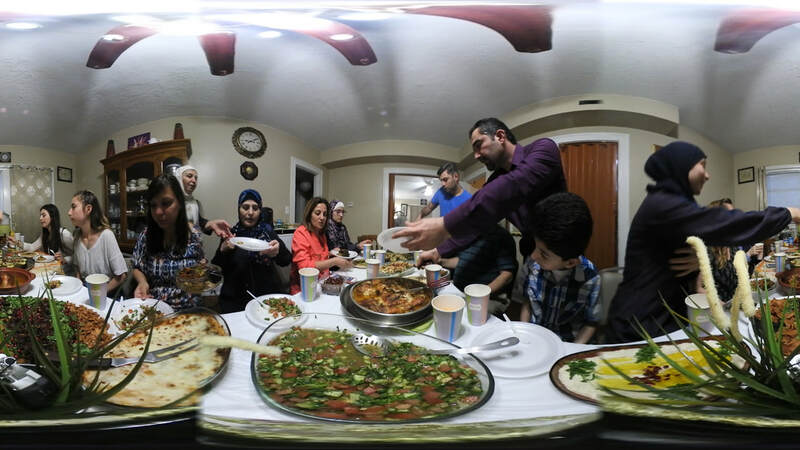 A family dinner during Ramadan, hosted by a Syrian refugee family, exactly one year after their arrival in the US.